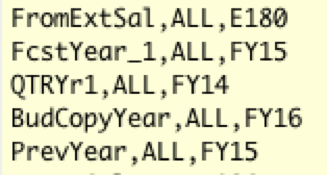 These days, I find myself working with on-premises applications quite a bit. So, once in a while, it is refreshing to look at what Planning’s cloud counterpart can do. 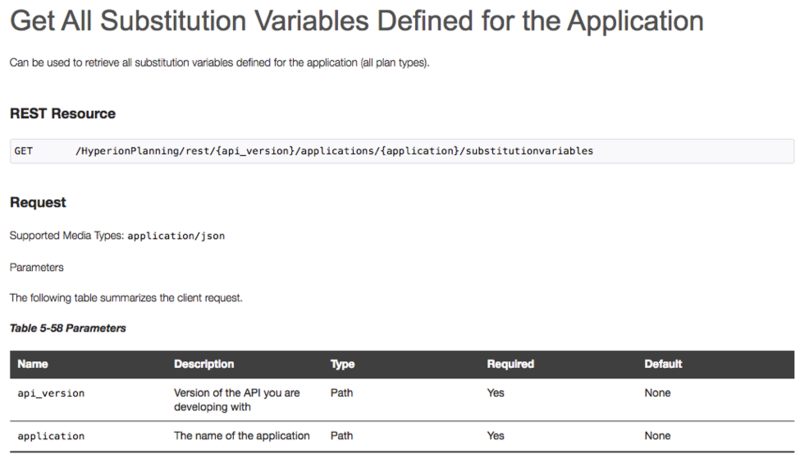 One of my absolute favorite features that Oracle has rolled out over the last few years is the advent of the REST APIs. I thought I’d do a “cloud” take on William’s excellent post on extracting substitution variables from Essbase (on-premises). The documentation shows us the available methods, particular to substitution variables. Specify the application we are trying to call, i.e., “HyperionPlanning”. “REST” and the version of the API. As of writing this post, PBCS is on version 3. We can now go about adding further levels based on our intent. In our case, trying to get substitution variables out of an application. The URI can be opened with the code below. That variable “json” will allow us to capture the result of our “GET”. And also, to see the results when we run the script. 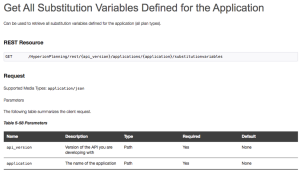 The application has a lot of variables…and there is no need to panic when you see that blob of text. If we look at the results in an editor, it will make more sense. All we care about, from the JSON response are the plantype name (or “ALL” for global variables), the name and the value fields. To get those results in a more palatable fashion, we can add one more bit of code which will iterate and give us a nice comma-delimited list. Much better. The whole script looks like this. // Basic authorization is set up, but the encoding for credentials need to be changed. I haven’t bothered with variablize-ing things or doing error checks, as the main purpose of this post is just to show how simple your PBCS automation needs can become with the use of REST and Groovy. It’s not a black box and it doesn’t need to be. Cheers. groovy, pbcs, planning, rest. Bookmark.